This compact and lightweight fisheye lens makes anything you shoot more interesting. With its frame-filling 180° angle of view and unique bending effects, every scene and subject will take on new dimensions through the viewfinder. Achieve great low-light results with its fast f/2.8 maximum aperture, and get as close to your subjects as 1.2-in. (3-cm) with edge to edge sharpness in every shot. 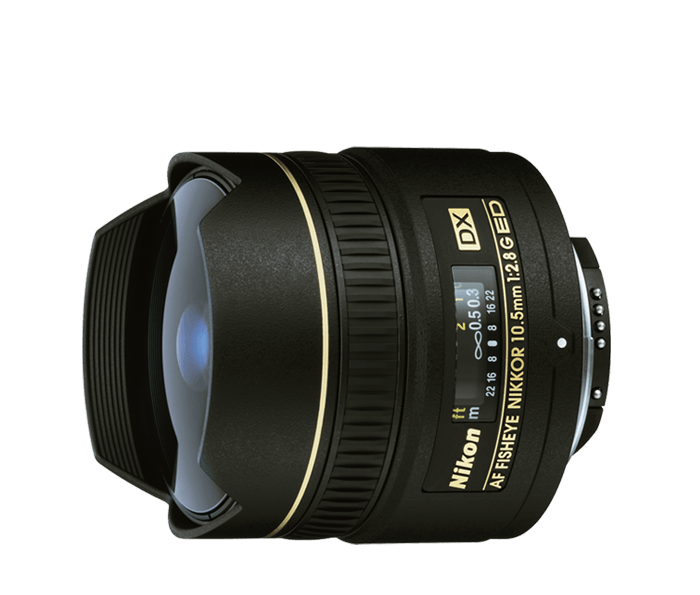 The AF DX Fisheye-NIKKOR 10.5mm f/2.8G ED achieves an ultra-wide picture angle of 180° on DX-format cameras while remaining compact and lightweight. Its unique fisheye bending effect with edge-to-edge sharpness opens up entirely new compositional possibilities. Try different viewpoints and angles to turn ordinary scenes into extraordinary photographs. And with a minimal focus distance of just 1.2-in. (3-cm), you can get an entirely new perspective on just about any subject. With a rounded diaphragm that makes out-of-focus elements appear more natural, a built-in flower-type lens hood and a 16mm equivalent focal length, the AF DX Fisheye-NIKKOR 10.5mm f/2.8G ED is optimized for DX-format Nikon D-SLR cameras. Its Extra-low Dispersion (ED) glass ensures superior sharpness and color, and Close-Range Correction (CRC) system provides high performance when taking pictures up close. The Close-Range Correction (CRC) system is one of Nikon's most important focusing innovations, for it provides superior picture quality at close focusing distances and increases the focusing range. With CRC, the lens elements are configured in a "floating element" design wherein each lens group moves independently to achieve focusing. This ensures superior lens performance even when shooting at close distances. The CRC system is used in fisheye, wide-angle, micro and selected medium telephoto NIKKOR lenses.